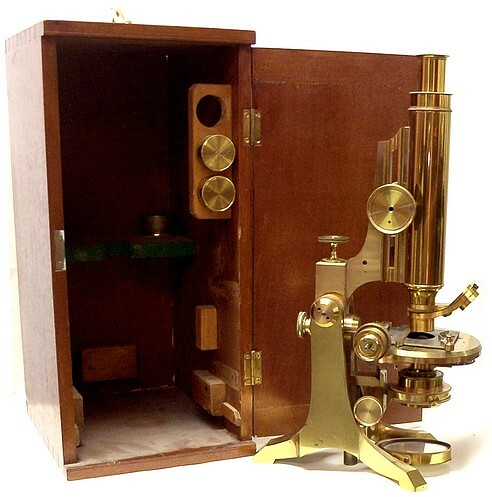 Ross's (Zentmayer) Student's Microscope. 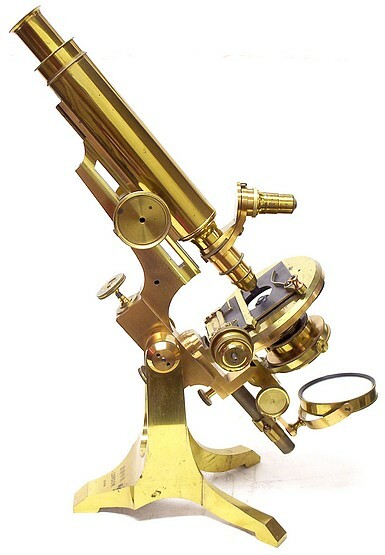 Another instrument of superior make (Fig. 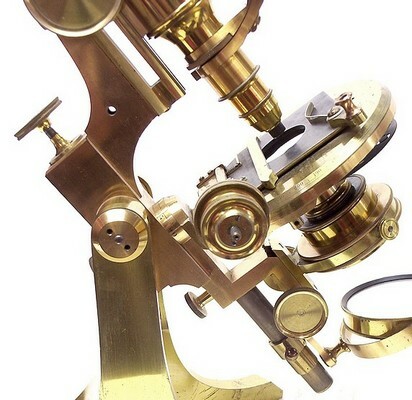 43), has lately been introduced by Messrs. Ross, with the view of affording to the Student the advantage of the ' swinging tail-piece for oblique illumination,' devised by Mr. Zentmayer; of which a fuller description will be given in its application to their First-class Microscope. 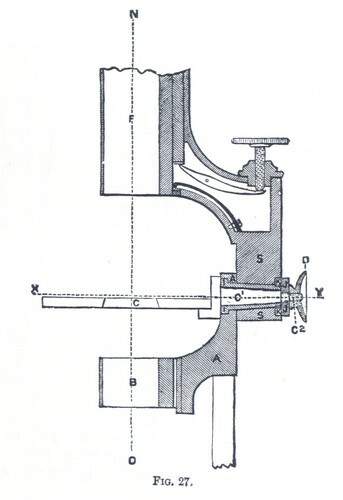 This tail-piece swings round a pivot which serves for the attachment of the stage to the limb; and at the back of the limb is a milled-head working on the projecting end of this pivot, by tightening which the stage may be firmly fixed in its ordinary horizontal position, whilst by loosening it the stage may be made to incline to one side or the other. 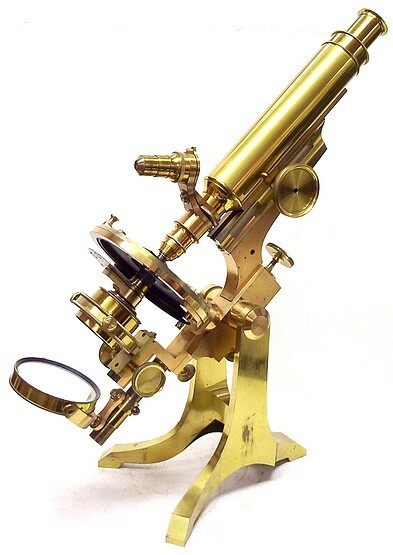 The ' tail-piece ' carries, between the mirror and the stage, a ' sub- stage,' fitting into which may be screwed an ordinary 1 inch, 1 1/2 inch, or 2 inch Objective, which answers the purpose of an Achromatic condenser; and when a pencil of light reflected from the mirror has been made by it to focus in the object, the swinging of the ' tail-piece ' to one side or the other will give any degree of ofcliquity to the illuminating pencil that may be desired, without throwing its focus off the object, as this lies in the plane of the centre round which it turns. The ' tail-piece' may even be carried round above the stage, so that light of various degrees of obliquity may be concentrated upon opaque objects. 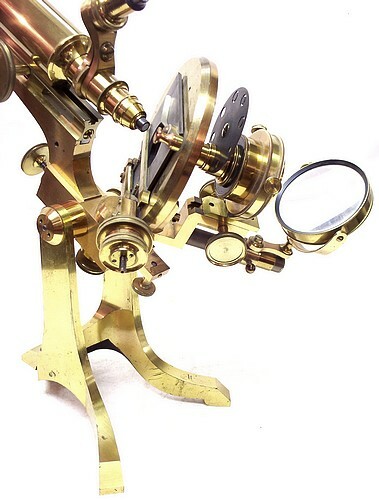 The object-platform of the stage is of glass, and rotates round the optic axis of the microscope; so that the object may be illuminated by oblique rays from any azimuth. A mechanical stage may be added, if desired. 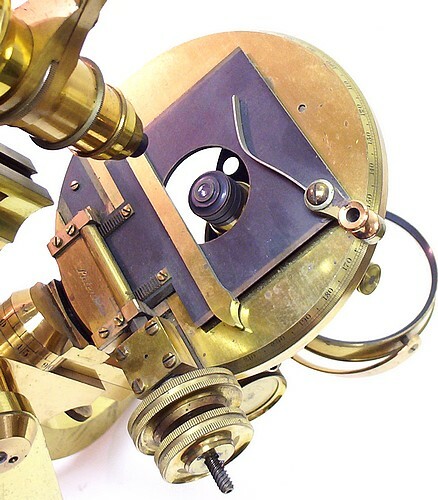 The workmanship of this simple model is of the highest class; and there is little real work, of which, in the hands of an observer who knows how to turn the instrument to the best account, it may not be made capable, by the addition of a Polariscope, Paraboloid, and other accessories, which its Sub-stage adapts it to receive. 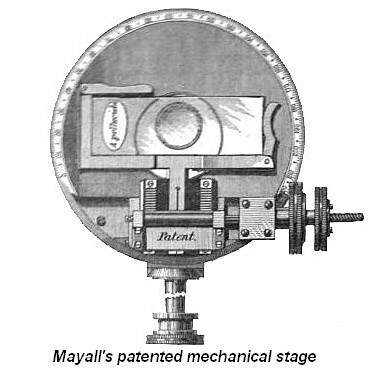 The example shown on this page is a more advanced model than that describe above having a focusing and centerable sub-stage fitted with an achromatic condenser and Mayall's patented mechanical stage. Swinging Sub-stage, or Tailpiece.- The Swinging sub-stage, although revival of an invention contrived by Mr. T. Grubb some twenty years ago, has been very generally adopted, since it is thought by manufacturers to be an important and useful addition to the more perfected forms of instruments. This tailpiece, represented in sectional elevation fig. 27, consists of S, the limb carrying the body, with coarse and fune adjustments; A, the stem carrying the sub-stage, B, and mirror. A is attached to S by the sleeve or socket I,. clamped by the nut J, and on I A may be swung sideways in either direction to the right or left, either below or above the stage, the axis of revolution which is the line X Y; that is, a line in the plane of the object to be viewed on the stage C, intersected by the optical axis of the instrument; that is, the line N O, passing through the centre of the body and the objects glass of the microscope The stage C is also attached to S by the pin C1, terminated by the screen C2, which pin passes through the contre of the socket I, and moves therein so that the stage C may readily turn in either direction in conjunction with or independent of A, the axis of its revolution being also the line X Y. 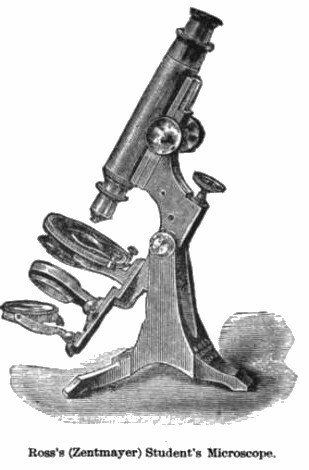 By this kind of arrangement the stage C and the stem A can be set at any angle to the axis of the microscope, either below or above X Y, intersecting the plane of the object to be viewed, and relatively to each other, and when so set the stage C can be clamped at the desired angle by the nut D on the screw C2 acting on S and the collar K.
Microscopes incorporating the Zentmayer swinging sub-stage were first offered by the Ross firm in the 1880 catalog.